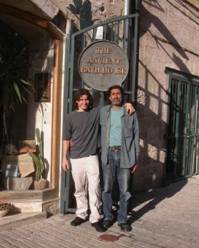 Elias was born in 1955 in Nazareth, and lived on Cactus Hill just above the Greek Orthodox Church and Mary’s Well. Elias along with the other children of Nazareth would close the drain from Mary’s Well and play in the water. He would stare at the shops located behind the Well, and wished that one day he would own one of these stores. 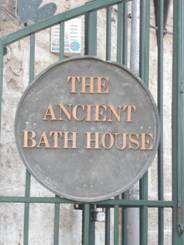 Little did he know that his destiny would bring him back to buy one of them and discover an ancient bath house there. In 1979 he bought a one-way ticket to Europe, and never thought he would come back. During his travels in Europe, he came to Belgium, where he met Martina in 1980. They married in 1981. Martina was born in 1958 in Antwerp, Belgium. Although being born in Belgium, her mother was from Slovenia and her father from Croatia. Her father started the Zagreb restaurant in the same year 1958 and it became one of the famous places in Antwerp, mentioned in the "Guide Michelin" with "2 forks". She traveled all around Europe as a young adult, and was just about to move to Venezuela when she met Elias, which changed her entire life. Jalil was born to Elias and Martina in 1989 in Jerusalem. Since the age of 4 he has helped his father with the excavation of the bath house, starting with a toy beach trowel. He has been a European Scout since the age of 12. He completed high school at Sisters of St. Joseph’s in Nazareth, as a very good student. This coming year he will be starting university studies in Belgium where he will be majoring in Aerospace Engineering. After getting married, Elias and Martina ran the Zagreb restaurant together, until 1986, when Elias felt a calling to come back to his home. They then moved to Jerusalem, until 1989, where they had their son Jalil the same year. They thought about buying a shop near the famous Jaffo Gate, unfortunately the first intifada started. This resulted in a terrible situation, causing both Elias and Martina to lose their jobs and the dream of owning their own business in Jerusalem. This in turn caused them to move back to Nazareth. In 1989, after moving back to Nazareth, they started the Cactus cosmetic and jewelry shop. In 1992, the land owner of their original shop requested everyone to move out in order to build a hotel, and Elias and Martina started searching for a new location. Fate would bring them back to the very same shop, behind Mary’s Well, that Elias saw as a child. This shop had not been sold for 10 years due to its very poor condition, until in 1993 Elias and Martina purchased the premises on the Saturday before Palm Sunday.